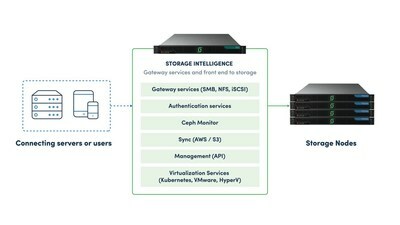 RUST, Germany, March 26, 2019 /PRNewswire/ -- Silicon Valley- and London-based enterprise storage startup, SoftIron, launches HyperDrive® Storage Router, the first truly unified solution for using Ceph across the enterprise, seamlessly incorporating all of your existing storage protocols. SoftIron's HyperDrive Storage Router is a highly intelligent services gateway for software-defined storage (SDS) that supports multiple protocols and enables enterprise-wide adoption of Ceph. By consolidating user shares, virtualization and any other storage technologies onto one scalable, high-performance platform, the power of Ceph is unlocked for the entire organisation, no matter the end user. SDS is an attractive enterprise storage solution due to its ability to scale as an organisation grows, and Ceph is widely considered to be the leading open-source software that underpins SDS. However, one of the biggest challenges for Ceph-driven SDS is its inability to support all of the necessary services an enterprise may need. Whilst Ceph caters to Block, Object, and File storage protocols, it is unable to simultaneously provide block service over iSCSI and file shares for users and servers using NFS, SMB/CIFS, until now. "HyperDrive Storage Router acts as the intermediary between all of these different protocols, finally allowing businesses to leverage Ceph as their unified storage solution. As you can imagine, this massively reduces the complications, delays, and costs that administrators have had to deal with in the past" says Tim Massey, SoftIron's CEO. "It unlocks the exponential potential of Ceph and SDS and allows the entire enterprise to benefit from his technology, regardless of the end user." "HyperDrive Storage Router has been built as a services gateway that can have different services modules added as features or requirements grow over time. The benefit for our customers is long term scalability and considerable cost reductions. A great example of this is support for VMware. You may want to consolidate all of your storage on Ceph and that is where you would use Storage Router. It exposes iSCSI block services to VMware while at the same time storing all data within the Ceph cluster, maintaining all of the benefits of Ceph for the enterprise" says Tim. "It will do for SDS what Uber did for transport." Coupled with the HyperDrive Storage Manager, all of this can be managed via a unified, online management system, vastly reducing the management complexity and overhead of your storage. SoftIron® makes the world's finest solutions for the data center. The company's HyperDrive® software-defined storage portfolio is built on Ceph; it's custom-designed and purpose-built for scale-out enterprise storage and runs at wire speed. HyperCast™ delivers the best density and value for real-time video streaming. SoftIron unlocks greater business value for enterprises by delivering great products without software and hardware lock-in.